The ADA recommends dental cleanings every 6 months for the average person that does not require periodontal therapy. In fact, decay can occur in the same amount of time resulting in the breakdown of tooth enamel and ultimately causing pain. Dr. Stacey and his staff will go over proper cleaning and home care to ensure maximum prevention of gum disease, decay and abrasion from improper brushing. All these conditions may cause hypersensitivity to cold, hot and/or sweets. Tooth whitening- This basically can be done with whitening strips or trays. You will find that the trays will in the long run be cheaper and reusable and also less cumbersome to wear. The material used in the tray will be stronger and usually used daily for 12-14 days for 2 hrs. Your teeth WILL BE sensitive to could since it is opening the pores of the enamel to clean them out. There is some Rx toothpaste that can help with this sensitivity. We use Opalescence as our tooth whitener. It is advised at times to whiten teeth prior to anterior crown procedures to get a more accurate match. All crowns have slightly different characteristics. Gold and Silver are the least cosmetic. However, they take out the “Chipping of Porcelain” factor. Gold is a superior metal that has been used for years. It is ductile, malleable, corrosive resistant, excellent polish capabilities and occludes nicely with the opposing tooth. Silver Color crowns are an alloy of metals to mimic gold properties without the cost of gold! PFM crowns have been the standard for white crowns for quite some time. They are tooth colored and strengthened with the gold or silver metal substrate to give a superior cosmetic appearance. All porcelain crowns are the most cosmetic and most often placed in the anterior area. The strength of the newer all porcelain crowns are now being used more in the posterior regions, though they have been known to chip occasionally. Tooth reduction, nerve location, abrasion, attrition, opposing teeth, cosmetic goals, patient habits, drifted teeth will all effect the deciding factor on what type of crown to use. Bridges are simply a string of multiple crowns attached together. The Abutment or Retainer crowns are the crowns that are glued to the existing teeth on opposite ends of the edentulous area. The Pontic or false teeth, are the crowns that replace the missing teeth. Generally, larger bridges are made using PFM’s, though smaller bridges (generally anterior teeth) can be made with all porcelain material. Dr. Stacey will discuss all possible options to make sure you get the type of crown or bridge that is best for you and to help prevent any potential complications in the future. Dr. Stacey provides a variety of dentures and partials. Approximately 4-5 appointments are necessary to make a denture. Third appointment is for denture trial. The denture is made in wax and looks like the real denture. The teeth ARE the actual teeth for the denture. The lip posture, smile line AND the bite are confirmed prior to the denture being processed. This is the appointment that is critical because what you see is what you get! Any changes can easily be corrected in the wax stage to get the desired look. When you give the “ok” for the wax stage, any changes made after this appointment may require additional costs and may not be possible. Dr. Stacey’s motto is "speak now of forever hold your peace!" Forth appointment is denture delivery….minor adjustments are made to make denture occlude properly and feel comfortable. Generally, after the patient wears the new dentures for 24 hours, additional adjustments may be needed as sore spots may arise. Dr. Stacey will discuss the details of each partial type to insure you receive the best option for you. The sequence to make a partial is similar to that of dentures. Generally, the breakdown of enamel is caused by the bacteria in the foods we eat. This results in the need to repair those surfaces affected not only by bacteria (decay) but also by the chipping of enamel or erosion or abrasion of the tooth. The tooth generally has five surfaces. There are 4 sides and a top with each side having a given name. When restoring a tooth, the number of sides generally will equate the cost. These sides are mesial (M), distal (D), lingual (L), buccal (B) and the top is occlusal or incisal (O/I). Traditional fillings that are used are Silver and White. Composite resin fillings are generally a given on anterior teeth. The posterior teeth can be done in Silver or White. The Silver fillings are going to be more cost effective since the material is less expensive and less labor involved. Composite resins have slightly higher cost due to material cost, bonding agents and additional time needed for placement. Gold and Porcelain inlays are significantly higher cost due to lab bills, second appointments and temporary fillings needed. You will find that many insurance companies will not cover these procedures. Dr. Stacey and his team will provide you with the options and information regarding the type of filling that can be placed if the need arises. Fluoride has been proven to help reduce tooth decay when it was introduced to the community water supply. For the developing child and adult, you would receive the recommend dose of fluoride systemically. However, with all the filtration on sinks, refrigerators and the consumption of bottled water, many people are not receiving the fluoride as readily. Also, those that obtain their water by means of a well do not receive the fluoride when consuming. 2-3 glasses of community water are recommended to minimize the breakdown of tooth structure (enamel). We are committed to keeping pace with the newer dental products that will help us provide the best dental care to those people that continue their dental care at our office. We hope to continue to look for new equipment to help further us in delivering excellent dental procedures. We hope you come visit and take a look around! Dental implants are made from medical grade titanium, similar to the metals used for hip and knee replacements. Dr. Stacey has introduced MINI implants for those with lower dentures needing/wanting additional retention. Generally, 4 implants are needed for the lower arch. Mini implants have also been used in replacing small anterior teeth in the lower arch. Simply stated, Mini implants are non-surgically screwed into the mandible and uses the concept of a male and female connector. X-rays are taken to determine bone morphology and subsequent placement location. Installation of the four mini implants can be placed in about 30-40 minutes. These implants can be retrofitted to an existing denture or utilized in the making of a new lower denture. Surprisingly, very little discomfort from placement is observed and Dr. Stacey prefers to wait one after placement before placing the connectors in the underlying lower denture. However, that does not mean you cannot wear your denture! Cost of 4 implants is approximately $3,000.00. Conventional Implants are used for crowns, bridges and for dentures. They are more costly and require a longer wait time before attaching to them. Some implants can be placed immediately after extractions BUT require a bone graft in addition to the implant. The reason for this is usually due to the shape of the root removed is significantly different from the shape of the implant. The bone graft helps with the healing and building of the bone around the implant. Generally, 4 months healing time is needed prior to fabricating a tooth, bridge or retention clip for an over denture. Implants can also be placed in edentulous areas where bone is sufficient. No grafting of bone is usually needed, however, 4 months of heal time is STILL needed prior to loading the implant with the planned prosthesis. Surgical guides and 3-D xrays are typically used in the edentulous areas to aid in maximizing placement of traditional implants. SOCKET PRESERVATION is an integral part of the implants process if extractions are performed and implants are considered in the future. This allows for healthy bone integrity if an implant is desired at a later date. This also minimizes cost and usually eliminates the need for bone augmentation in extraction sites due to lack of bone. Dr. Stacey provides both Mini and Conventional Implants. 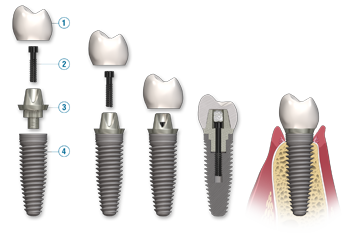 The costs of Conventional Implants are significantly high then Mini Implants due to the material, complexity and attachments that are fabricated for the implant. Call our office to schedule a consult and let us explain these procedures in more for you in more detail! Dr. Stacey has been extracting teeth since graduation and continues to perform multiple extractions. 3rd molar extractions (Wisdom teeth) are routinely done regardless if they are impacted or not. Primary teeth extractions certainly can be challenging on the little ones! Dr. Stacey has successfully removed numerous teeth over the years. He prefers local anesthetic and possibly an anti-anxiety medication (if needed) for such appointments. Individuals needing IV sedation or nitrous oxide will be referred to an Oral Surgeon to help in those instances. Dr. Stacey does a wide variety of braces and spacers in the office. Dr. Stacey can straighten teeth using the traditional metal brackets. At this time he does not utilize Invisalign technology. Dr. Stacey will evaluate your bite and any concerns you have with your smile line. If crowding is a concern, Dr. Stacey can discuss orthodontic options and also extractions if any would be needed. Dr. Stacey also is capable of surgically exposing teeth and placing chains or brackets to help assist in eruption of the tooth. For those individuals that have cranial – facial defects and severe malocclusion that require more complex treatment, Dr. Stacey will refer to a specialist. If you have any conditions that can be corrected with straight wire technique, Dr. Stacey can discuss your treatment options with you. Dr. Stacey can also make retainers and service bonded retainers that may have come loose over the course of years. Gum disease is a bacterial infection that attacks the oral tissues and bone. It has the tendency to regenerate bacteria after dental cleanings that can break down the bone requiring more frequent cleanings. Most periodontal patients must get their teeth cleaned every 3-4 months for these reasons. Unfortunately, there is no cure for gum disease similar to diabetes or heart disease, it can only be controlled. in latest studies, gum disease has been shown to affect the heart and your overall health. Smoking will influence gum disease due to the nature of bacteria and tobacco. Good home care and regular cleanings, fluoride and sometime antibiotics can help maintain minimal damage to the tissues and bone. Unfortunately cleanings in this fashion are a lifelong commitment. Bone grafts and tissue grafts are usually performed by periodontist. Periodontist are specialist that primarily work on bone and gum tissues. They also perform extractions at times when a bone graft is placed in the socket and they are also well versed in installing implants. Dr. Stacey will examine your gum tissue every cleaning, discuss the health of your tissue and make recommendations as needed. Dr. Stacey and the periodontist at times team up and alternate cleanings to help keep costs down and also perform dental checkups for cavities. It is vital to keep the tissue healthy to ensure a lasting smile. We will do whatever we can to motivate one to continue their home care and regular visits! Treatment consists of removing the nerve tissue out of the roots and replacing it with a material to seal the root tips (apex) so that bacteria cannot come in or out of that existing space. It should be noted that not all root canals are going to have the same post op outcomes. Root canals are done for several reasons which can possibly have different pain levels after the procedure. Someone that comes in with severe swelling is likely to have more discomfort than one that chipped a tooth and exposed a nerve after a root canal. Most root canals can be done in one appointment. However, at times a second appointment may be needed due to severe discomfort/swelling that may make it improbable to finish that day or possibly excessive fluids that would deter bonding of the material inside the tooth. Complex root canals with multiple roots or severely curved roots could lead to second appointments. Dr. Stacey can generally do most Root Canals in the office. There are a few times a year that he will refer a root canal to a specialist (Endodontist) due to the complex nature of the tooth. Dr. Stacey’s staff will assist in finding you a suitable Endodontist. Sealants are a plastic coatin g that goes on the top surfaces of molar and bicuspid teeth. Statistically, most cavities that arise on the developing child is on these surfaces. These surfaces are called pits and fissures which are difficult to keep clean since the bristles from the toothbrush generally cannot reach those areas! The procedure is simple. The tooth is thoroughly cleaned and then a tooth etchant is placed on the tooth for 20-30 seconds and rinsed and dried. Then the plastic coating is applied and a light source is use to “cure” the resin similar to white fillings. The color of the sealants can vary from white, clear or tinted yellow. We use white color so that the patient can view the sealant for possible loss. No anesthetic is used and isolation of the teeth and keeping the tongue away from the work area is all that is needed! Sealants are placed preferably within 6 months after the tooth has erupted. This is usually around age 6 and age 12. Sealants can be applied more than one time if needed BUT they CANNOT be applied to teeth that already have fillings on them! Veneers are another way to improve one’s smile. They are simply a porcelain facing that is bonded to the outside (facial) of the tooth. They can close gaps between teeth and hide imperfections on the outside of the tooth. However if one has an existing filling on a tooth, it is better to restore with an all porcelain crown to prevent breakdown of the old filling that may severely affect a veneer. Heavy bruxism and finger nail biting or any similar habits will also affect the long term success of veneers due to minimal coverage and bond strength from excessive tensile strength.